When I was in the seminary, I had a classmate who was one of the more gifted and talented persons I have ever known. You know the type - the person who "can do no wrong." He was well-liked by most everyone and just had a way about him that gave an aura of giftedness. What I found even more impressive was the way in which he would always deflect praise in a very unassuming way and always say, "Praise God!" whenever he was complemented. I once asked him why he used to say, "Praise God!" instead of "thank you" or "you're too kind." He said that he began saying "Praise God" when it really hit him one day that all of his talent success wasn't about HIM - it was really about the Lord. There was a real humility in this seminarian's answer - he just had a very good sense that all the good that any of us do is a glimpse of the totality of all good, who is God. The reason why I chose this anecdote is because every year, the readings of the Second Sunday of Advent always involve message of St. John the Baptist. John the Baptist is the epitome of what it means to truly acknowledge and accept that it's not about me - it's about the Lord. John the Baptist's message does not attract people to him - the message points others to Jesus. It's a message that we've all heard before: repentance; the forgiveness of sins' preparing the way of the Lord. Today, the Gospel depicts John the Baptist's fulfillment of the prophecy found in Isaiah and in our first reading from the prophet, Baruch, "Prepare the Way of the Lord, make straight his paths. Every valley shall be filled and every mountain and hill shall be made low. The winding roads shall be made straight, and the rough ways made smooth..." Yet, what do these words mean? How would they have been understood by the Jews of old? Historians tell us that in antiquity, there was always an attempt made to build towns and cities upon hills or other elevated land areas. Doing so would make the town easier to defend and one could see advancing armies from a long distance away, allowing the city to prepare for a battle. In such a town, it was quite typical that the roads leading up to the city gates were winding roads that followed the natural contour of the land and kept the ascent to the town at a minimum grade of steepness for travelers and their animals bearing cargo. However, when the town knew that the king or the emperor was coming to the town, the local leaders and townspeople would carve out a more direct route to the city gates so as to expedite the king's path to the city. This would sometimes require moving large amounts of soil and earth in order to provide this more direct route - it would mean filling in valley areas by using soil taken from the top of mountains in order to accomplish the task. Rather than subject the king and his entourage to climbing up winding roads, the townspeople would prepare a straight path right to the city gates. So, when the Jews heard the prophecies of Isaiah and Baruch and when John the Baptist repeated their prophecy, the Jews were quite aware that all three men were making reference to a practice they had engaged-in for centuries. 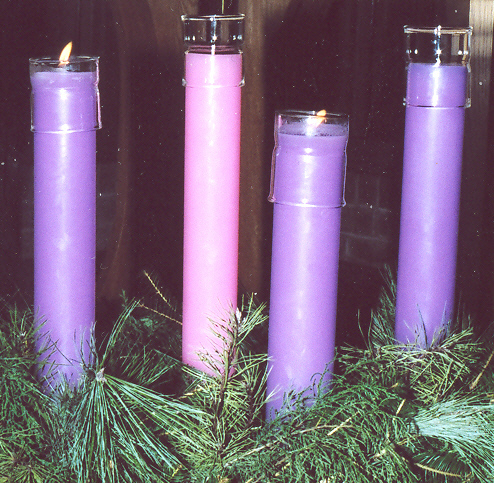 Of course, the practice of making straight the way of the Lord is a wonderful metaphor for our Advent journey. Like the Jews of antiquity, we too, are called to make straight the way of the Lord - the greatest king, who will visit His people once again at Christmas. Of course, the type of work that we need to engage in to make straight the way of the Lord is much different from what the Jews did to prepared the way for a temporal king. For us, making straight the way of the Lord takes different forms and different degrees of effort and time. Each of us here can readily identify faults, habits and sins that we all want to eliminate from our lives, with God's help. This is almost always easier said then done. Advent provides us with a golden opportunity to face up to to the reality of our lives - where we are spiritually and how our spiritual lives animate or fail to animate the other aspects of our daily living. As these coming days and weeks come and go, we will inch closer and closer to the Christ - child in the crib at Bethlehem, innocent and pure in the arms of the Blessed Virgin Mary. It's as if our Lord's innocence and childlike dependence on His mother forces us to confront who we are and who we want to become. Our Lord's purity and all of the hopes and dreams that our Lady and St. Joseph had for Him invites us to in our daily moral decision-making. In our second reading, St. Paul expresses his confidence that God, who has begun good work in the Philippians, will bring it to fulfillment in Christ Jesus. The same is no less true for ourselves. By virtue of our baptism in the Lord, we are all fully-equipped with every grace we need to cooperate with God's plan to get to heaven. Moreover, our Lord provides us with the graces of the other sacraments and other actual graces throughout our lives to better ensure that we have even more assistance in getting to our heavenly homeland. St. Paul earnestly desired that the Philippians increased in their mutual love, that they increased in their knowledge of the Faith and their capacity to discern between good and evil to the glory and praise of God our Father. Similarly, our Lord desires our salvation as well. We do well to ask ourselves, "Do we desire heaven as much as we should - with all our heart, with all our soul, with all our strength, with all our mind or do we merely desire only getting as much as we can out of this life?" As we take time this week to discern out those mountains of pride that we need to level out and those valleys of distrust in God that we need to fill-in with greater faith, hope and love, let us not forget to also take time to discover how we can make the path easier for others. My spiritual director always challenges his directees, "What are you doing to make the path of Christ easier? Are you an instrument of easier access to Jesus or are you an obstacle?" These are questions that each of us needs to answer. Perhaps it's a lack of gentleness or compassion; maybe it's the need to always be right; maybe it's a grudge we've been holding or perhaps it's a general laziness when it comes to things of spiritual growth that does not encourage others to seek the Lord. As we continue our celebration of Advent and in particular, this Mass, let us never lose sight of the fact that our Lord is not very far away. He comes not only each Christmas, but in the miracle of every Mass, where ordinary elements of bread and wine are transformed into the vary body, blood, soul and divinity of our Lord and Savior - a foretaste of the divine glory that awaits those who have made straight the path to the new and heavenly Jerusalem on high.